As of the date of this post (August 2016), I am 65 years old. When I wake in the morning, I often think, “I feel like the Rock Island.” Those of you younger than a certain age don’t have the slightest idea what I’m talking about. Those older may understand but don’t want to be reminded. 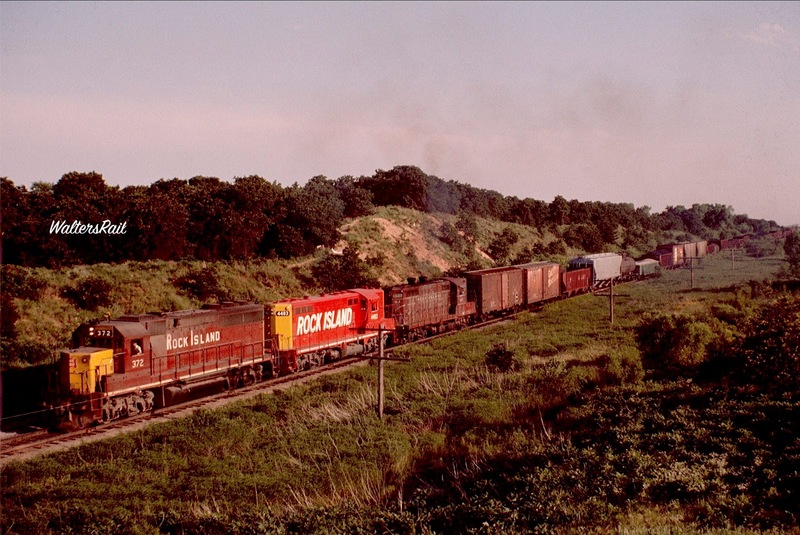 When I remember the Rock Island, I recall Oklahoma red dirt country and a train rocking crazily, tracks obscured by tall grass, and the damn thing coming at me with no visible means of support. In the last years, this was not too far from the truth. The Rock was a perpetual oddity. Some of its most direct routes (Memphis-Amarillo, an almost straight shot) carried little traffic, while some of its more circuitous routes (Kansas City-Houston by way of Herrington, Kansas, and El Reno, Oklahoma) were fairly busy. The railroad never seemed to have enough money. Track, roadbed, rolling stock, engines – all were in various states of disrepair. 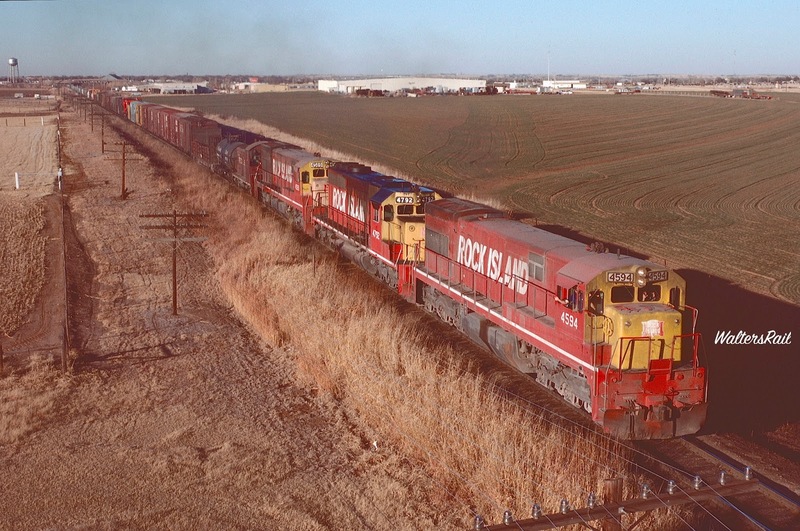 The Rock’s operational center in Oklahoma was not in the logical spot, Oklahoma City, but in a yard about 20 miles west in El Reno, where the north-south main crossed the Memphis-Amarillo line. El Reno was, and still is, a small, county-seat town, roughly in the middle of the approximately 100 miles-wide belt in western Oklahoma where hard-red winter wheat is grown on dry land farms. 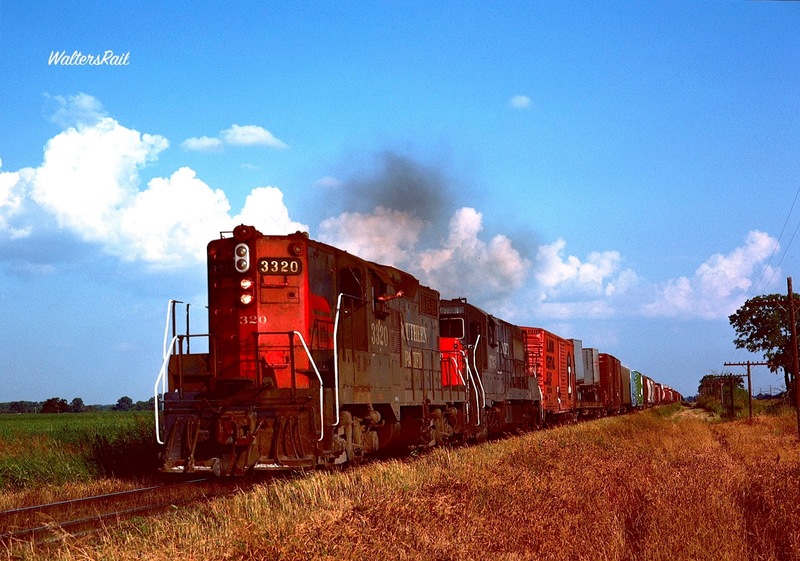 The north-south main traversed those fields in some of the loveliest, red dirt country you will ever see. 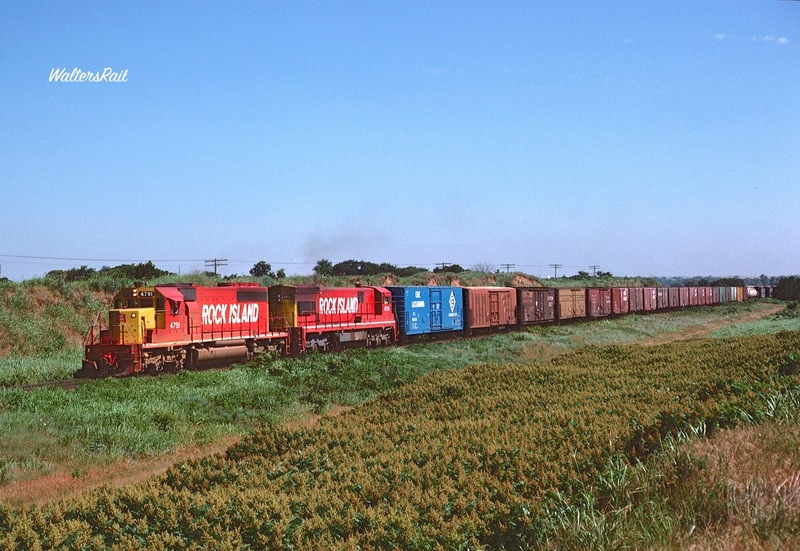 During harvest – early May to early June, south to north – one could chase trains through the ripening gold grain from Kansas south all the way to the Red River on U.S. Highway 81, encountering few automobiles and fewer towns. 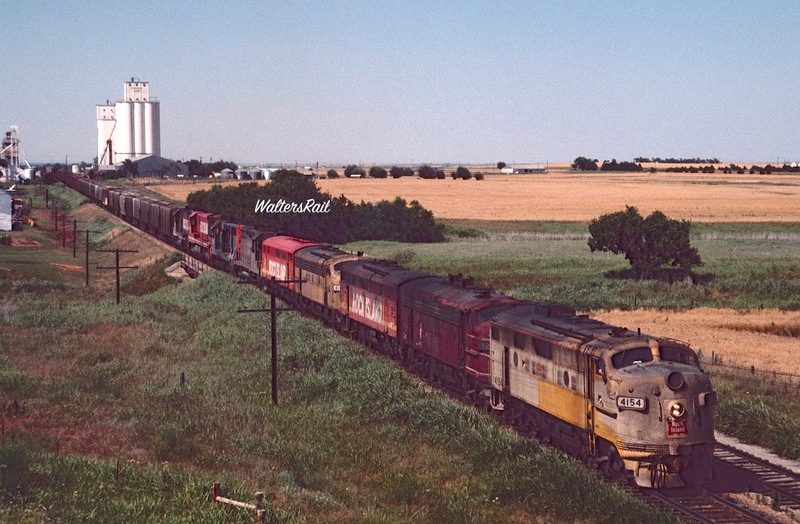 The line north of El Reno was Centralized Traffic Control; south it was Automatic Block Signal. 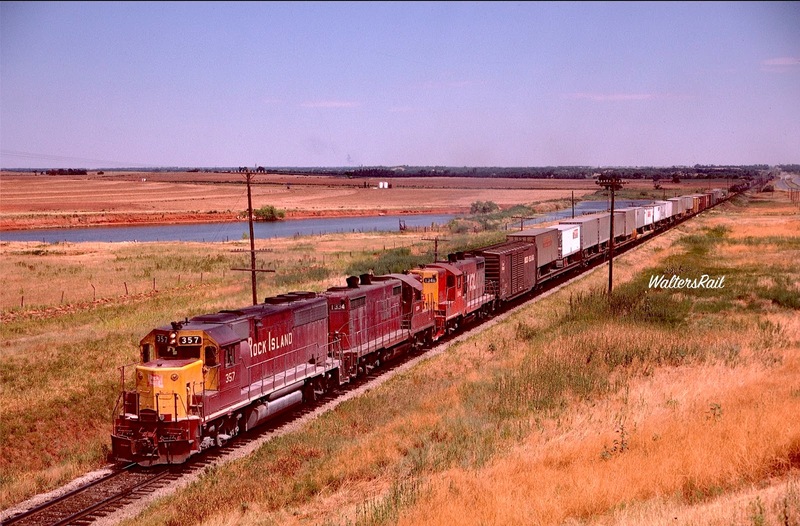 A northbound freight reliably left El Reno every morning about 9:00 a.m. Catching a freight climbing Concho Hill north of town was always a treat, especially since the trains were often underpowered, and stalling on the hill was a possibility. At the top of this hill was another oddity, Concho: the location of a Cheyenne and Arapaho school originally named Darlington, established in 1887. In 1932, a new school was constructed, and the name changed to Concho Indian Boarding School, which remained in operation until 1969, when an even newer school was constructed. This facility remained open until 1981, when federal funding ceased. In my mind and the pages of most historical accounts, those boarding schools (all closed now) were horrible places where native Americans were forced, often through physical abuse, to give up their own culture and adopt the ways of Europeans. Yet I know people who went to school at Concho, and they all have fond memories of the place. In any event, the Cheyenne and Arapaho have had the last laugh, because Concho is now the site of an Indian casino that draws crowds from Oklahoma City to play blackjack and feed slot machines. I think this is proof that God loves irony. 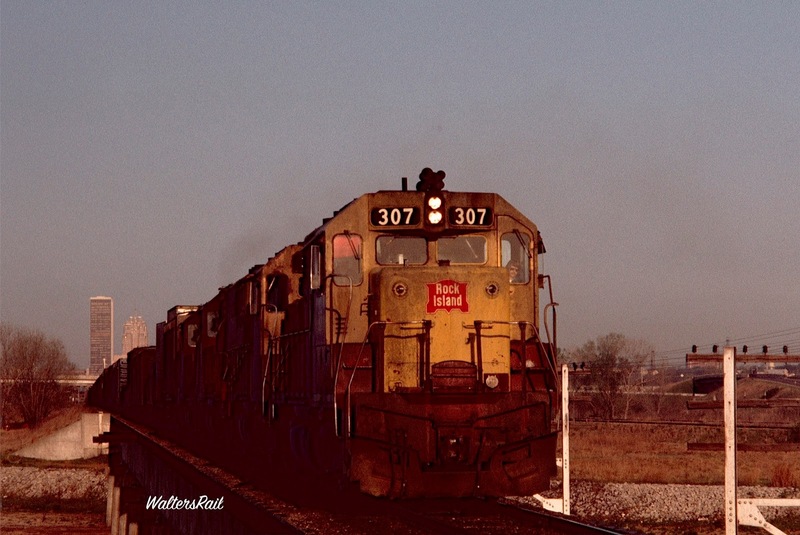 In addition to the northbound morning train, the Rock Island during the 1970s ran an eastbound out of El Reno at 8:00 a.m. 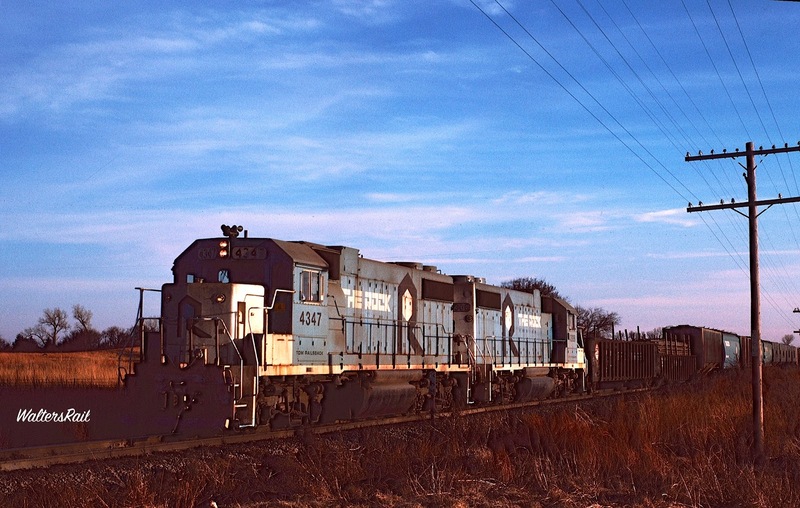 I would sometimes chase it through Oklahoma City and eastward until I found its sister, a Little Rock-generated westbound, which I would then follow back home. 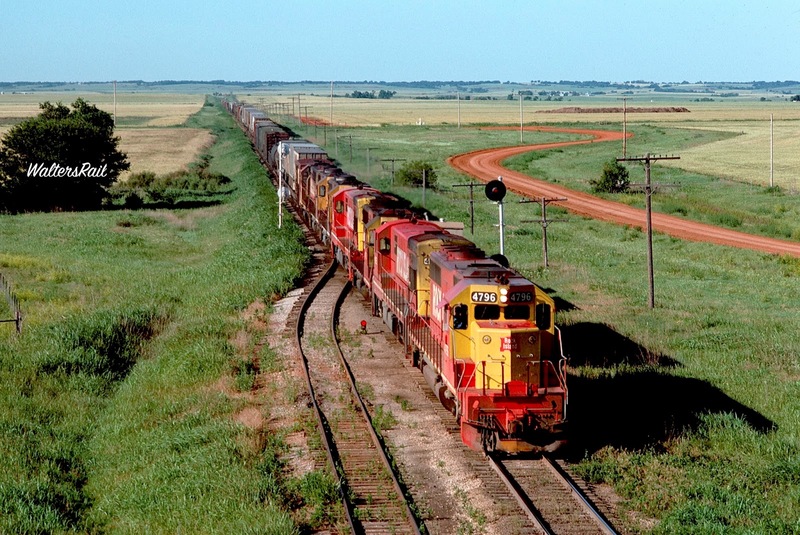 The trains often met in the early afternoon in the small town of Calvin, along the banks of the South Canadian River, where the old Kansas, Oklahoma and Gulf (by then a Missouri Pacific line) crossed at a diamond that generally saw four trains (two on each railroad) every 24 hours. There was so little traffic and other activity at Calvin that you could stand by the tracks and not hear a sound other than the wind, which often did not blow in the river bottom. To the north, you could see the winding route of the Missouri Pacific past Tabletop and Lamar Mountains, through country too rugged even for a dirt road. The only passage was on the railroad, and since passenger trains were long gone from the line, I never ventured into that wilderness, nor have I ever seen a photograph taken there. 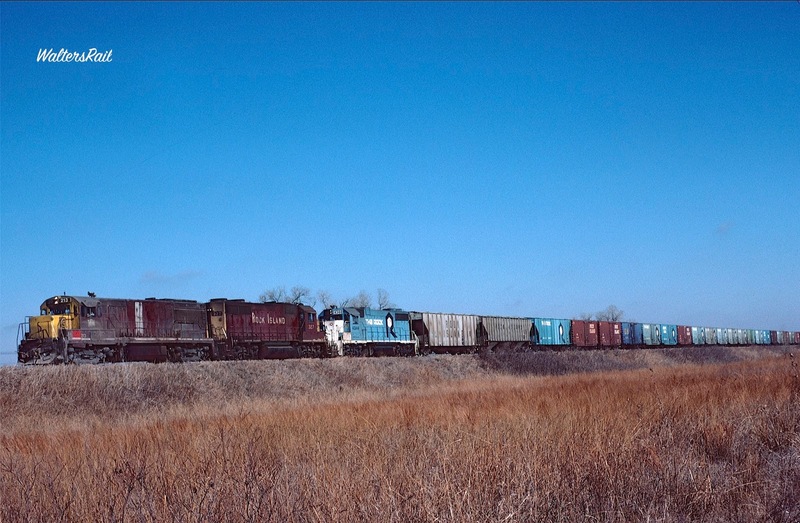 The Missouri Pacific line is also now long gone, torn up and sold for scrap when Union Pacific took over in the 1980’s. East of Calvin, the Rock Island wound through hills and forest toward McAlester and a U.S. Army ammunition plant that supposedly stored enough ordnance to eviscerate all of Oklahoma and Arkansas plus a good portion of east Texas. 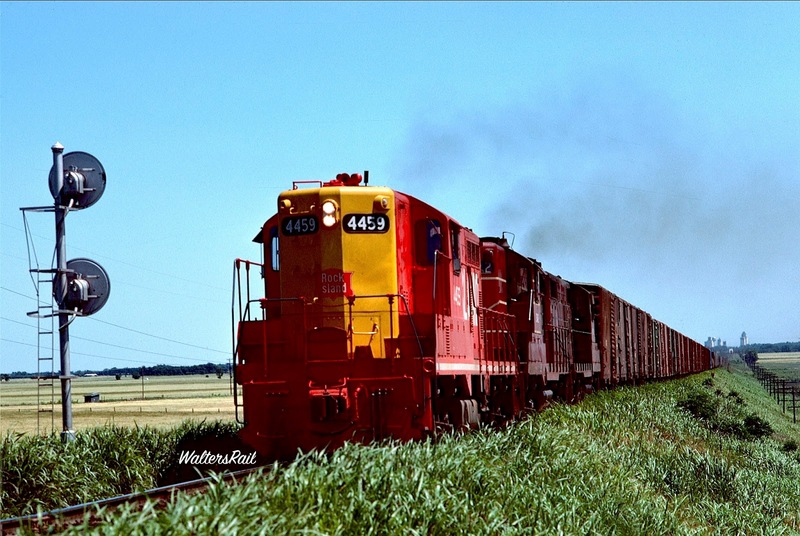 I remember standing by the tracks one afternoon in March of 1975, chatting with the crew of the eastbound from El Reno, waiting for the approach of the Little Rock train. These were not large consists, rarely more than 50 cars, but the terrain was rugged, and you could hear the westbound attacking the grades a good 10 minutes before the headlight appeared down a tunnel of trees. 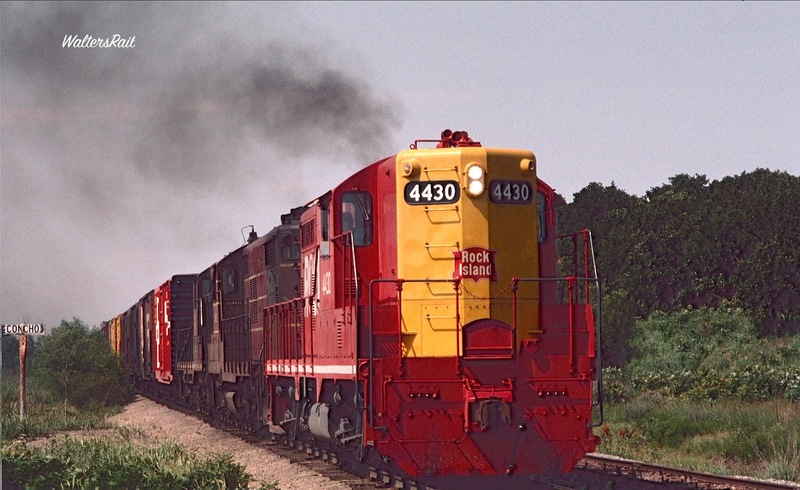 On that mild, late winter day, the westbound was led by a recently repainted (bright red and yellow) unit, followed by four grimy engines that appeared to have been to hell and back. 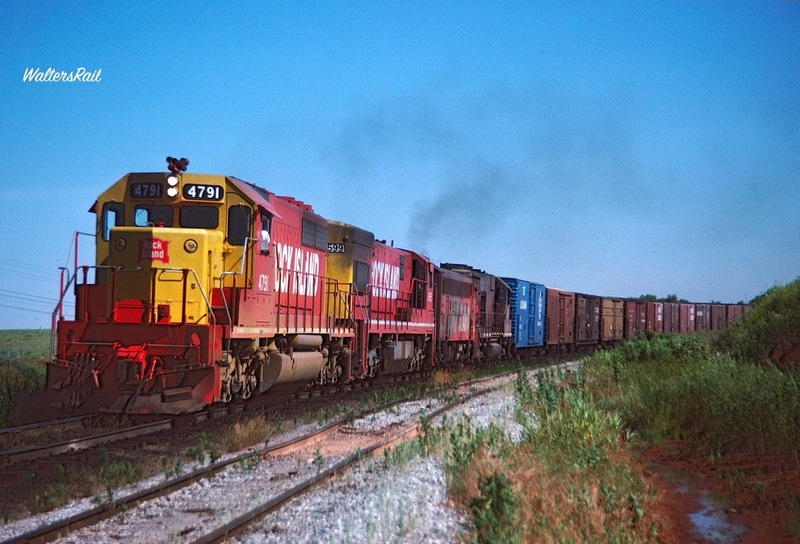 I followed the train west as it first crossed the river, then turned north toward Holdenville on a steep grade, where the freight slowed to about 10 mph. Suddenly, bright orange flames appeared above the exhaust port of the third unit. I could just barely see the train through the leafless trees, but the flames were easy to spot. The train slowed even more, making me think that it was going to stall on the hill. But it kept moving, barely. I was not in a position to take a shot. A crewman emerged from the lead unit, fire extinguisher in hand, ambling along the catwalk toward the flames, in no hurry at all, as though he had seen units catch on fire many times. My vehicle was approaching a clearing. Just a few more seconds, and I would get a shot of the flames. The train slowed almost to a stop. The crewman approached to within 10 feet of the flames, then discharged a mushroom cloud, like a tiny atomic bomb, from the extinguisher. I reached the clearing, parked and jump out of my car. For an instant, flames and cloud existed simultaneously. Then the portal between them closed, and the flames vanished -- about ten second before I snapped the shutter! The crewman attached the fire extinguisher to the hand rail of the third unit, in case the flames reappeared, then turned and began nonchalantly walking back to the lead unit. 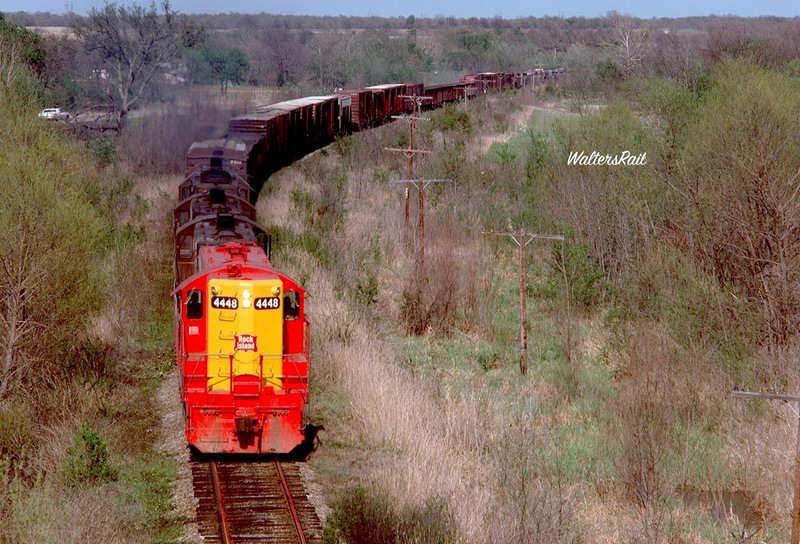 I followed the train all the way back to Oklahoma City, taking photographs. The fire extinguisher is clearly visible on the railing of the third unit. I don’t think the train ever exceeded ten miles per hour the remainder of the journey, even downgrade. The third unit did not catch fire again. The burning train was symbolic of a railroad that had been in intensive care for decades. 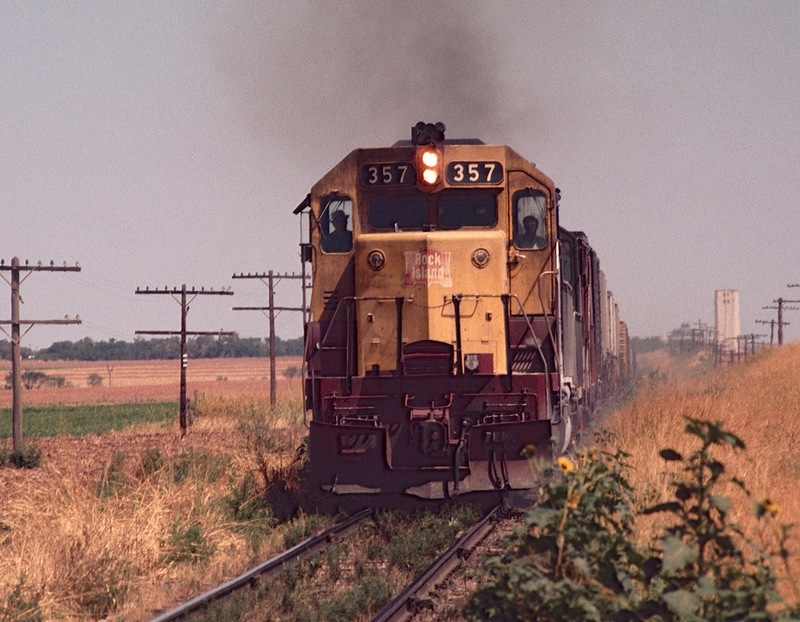 Convinced that a merger with a stronger line was the only way to survive, Rock Island executives sought to join the Southern Pacific, but in 1962, rival Union Pacific made a counter proposal to split the ailing CRI&P with the SP, mainly because the UP coveted the Rock’s Chicago-Omaha line. Unfortunately, the Interstate Commerce Commission’s hearings on the case dragged on for 12 years, by which time the Rock had deteriorated to the point that the UP no longer wanted the Rock Island carcass, which resembled the discarded shell of a cicada. At the time, I could not conceive how a federal administrative body could be so dilatory. Having practiced law before the Federal Communications Commission and various state regulatory bodies for more than 30 years, however, I now understand clearly. Regulatory agencies, sooner or later, become ends in themselves, serving no purpose at all beyond maintaining their own existence. This appears to be a rule of nature. If the ICC ever had a purpose, it was lost years before Congress abolished it in 1995. So the Rock limped forward on its own, losing more money, while the track, rolling stock and power deteriorated even further. One of the labor unions – I no longer remember which one – threatened a strike. Management responded that a strike would precipitate bankruptcy. The union called the bluff – except there was no bluff. Management filed for bankruptcy. The trustee took one look at the property and moved to modify the filing from Chapter 11 (reorganization) to Chapter 7 (liquidation). To the surprise of both union and management, the Judge granted the motion. In those days long before the internet, I followed the Rock Island’s fate in the newspapers. I was a young lawyer who knew enough about bankruptcy law and liquidation to realize that the railroad’s parts were being sold to the highest bidders. 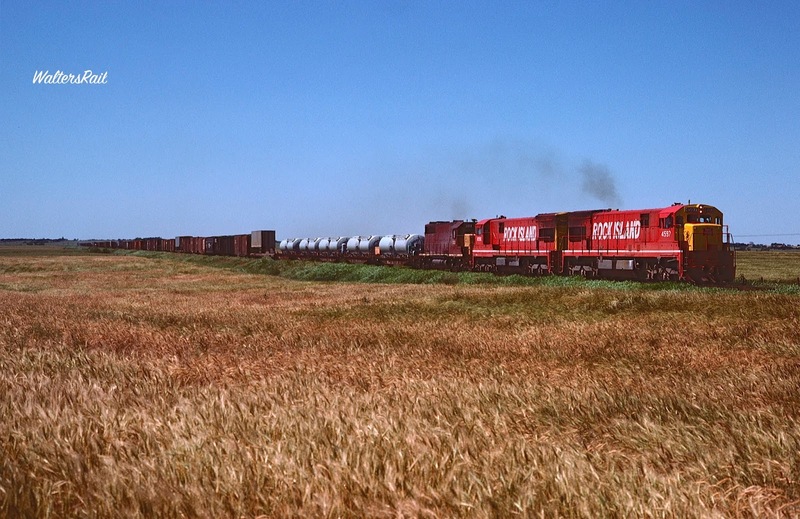 Some lines had value – the Golden State Route from Kansas City to Santa Rosa, New Mexico – and were purchased, while others – the line from Amarillo to Tucumcari – did not and were literally pulled out of the ground. The trustee announced when all operations would cease in March of 1980 – a mercy killing. 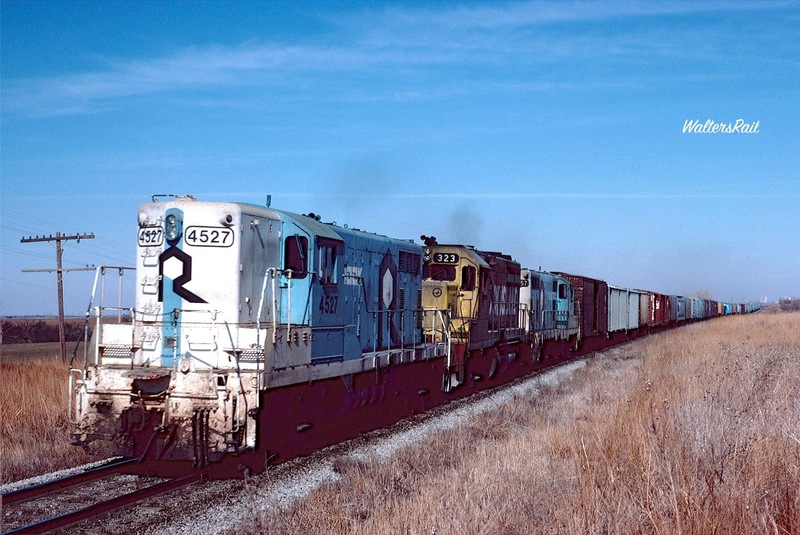 On the last day, I drove to El Reno to see if any trains would run. The yard was deserted. I parked near a maintenance building and looked in vain for an employee. Had I wanted, I could have walked anywhere, into any building, and hauled away anything I could carry. Inside one building was a blackboard on which crew assignments were written. Two trains were listed, and my hopes soared. Then I noticed that both were scheduled to run the month before. The lack of sound in a deserted yard is eerie, because if railroads do anything, they make noise -- but not El Reno, not that day. The railroad was dead. Out of curiosity, I walked among the weed-infested tracks. 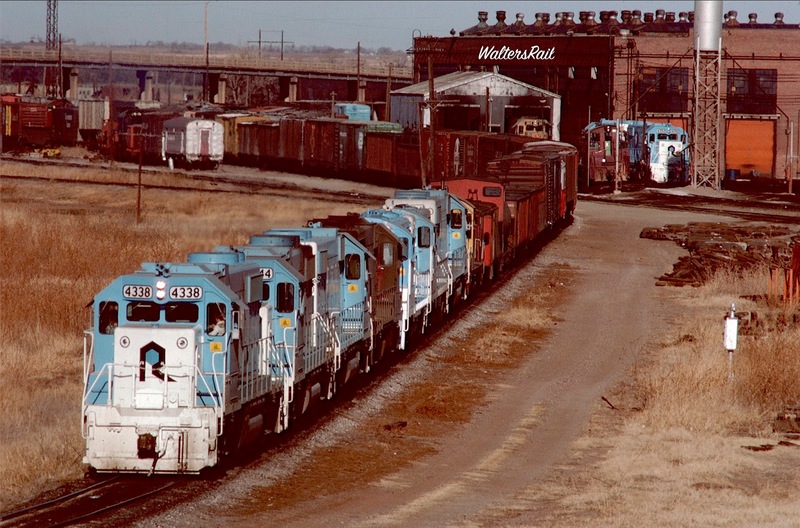 Hundreds of box cars had been brought in from around the southwest and were parked in long strings, awaiting disposition. A long line of dead power stood near the engine terminal. I could not believe then, and still cannot believe, that the place was deserted. Maybe there were employees on site, and I had missed them. Disappointed that I would not be able to photograph a final freight, I returned to my car. At that moment, I heard a whistle west of the yard, where the north-south mainline years before had been routed on a by-pass. 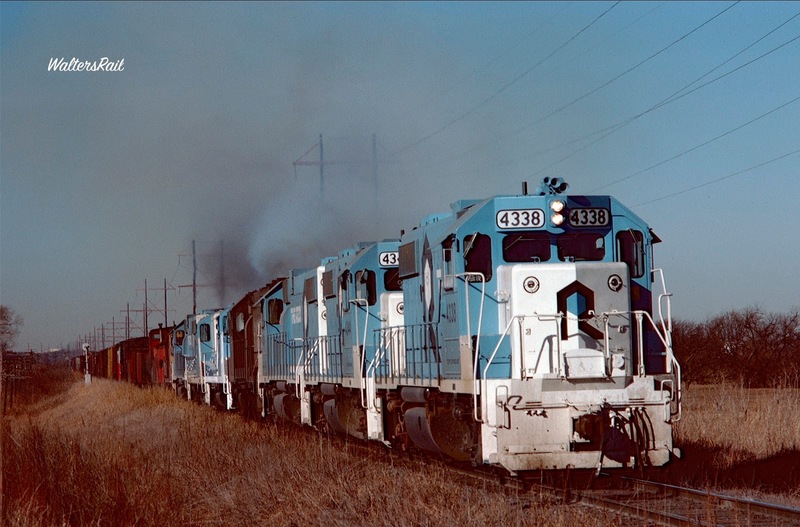 To my amazement, a train appeared, pulled by newly repainted units in a modernistic blue and white scheme called “The Rock.” The train stopped short of the diamond where it crossed the line west to Amarillo. It was late afternoon; the sun was approaching the horizon of a blue sky cob-webbed with cirrus clouds. I assumed that the train would remain motionless and never run again. Then, to my amazement, the crew whistled, and the repainted units began to roll slowly northward. I started my vehicle and raced toward Concho Hill. The sunlight was minimal, and the train was moving slow, but I managed to take several shots before the light disappeared completely. I don’t know if that was the last Rock Island train to run out of El Reno, but I’m pretty sure it was the last train to run out of El Reno in the daylight. As the Rock Island collapsed head-first down the stairs, the motive power became more and more incredible. 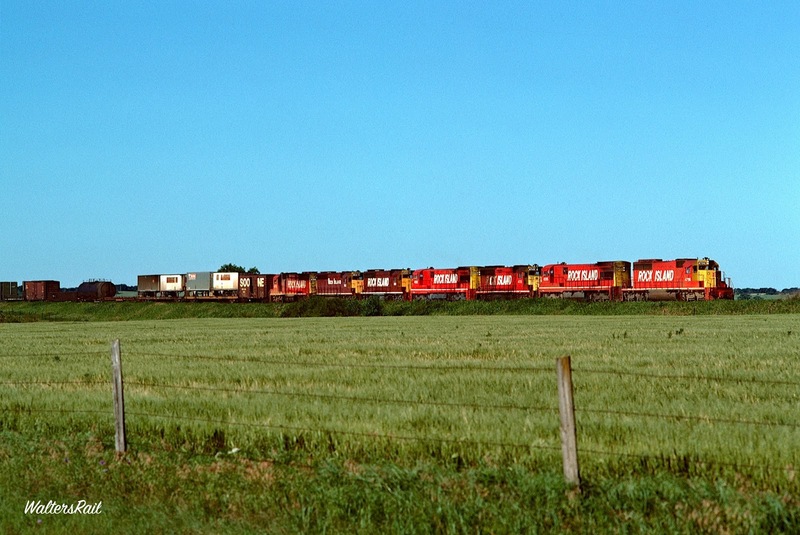 It was not uncommon to see trains pulled by lead units without functioning headlights. This probably violated several federal and state laws, but who was going to enforce them? And what was the penalty? A fine? How would the Rock Island pay it? Virtually every unit running in and out of El Reno belched black smoke, often so thick that it was difficult to photograph the train. On many units, I observed what looked like ulcers, open sores, as though the railroad had contracted leprosy. Many units were so covered with grime that markings, even the name of the railroad, were illegible. Every now and then, one of the newly repainted, blue and white units, bearing the legend “The Rock,” would appear. This event was very startling, a little like seeing an alien chewing its way out of the belly of a space crewman. But the most visible symbol of the Rock’s demise was the roadbed. 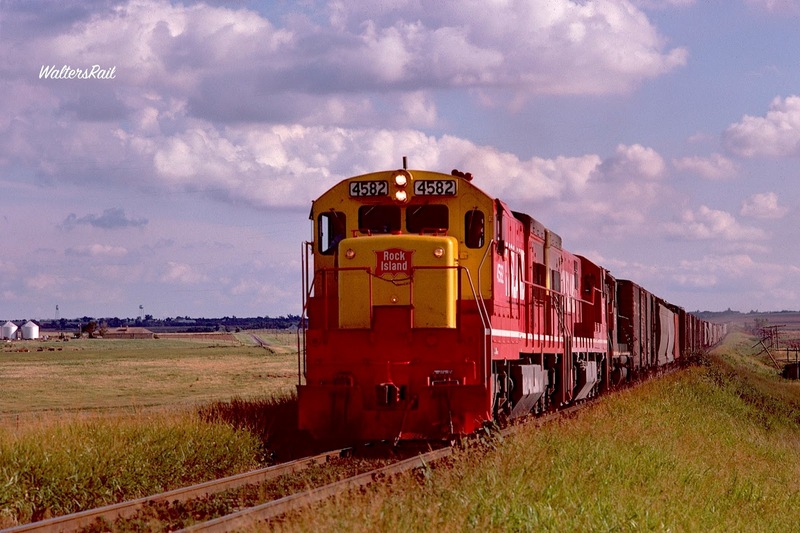 I have a photograph of a train coming at me in which the tracks are invisible, lost in Johnson grass as tall as my waist. This was a mainline freight, south of El Reno, running at track speed, which even in the last days was around 30 miles per hour. The train rocked wildly from side to side, bouncing with abandon, and I had the impression that the crew were attempting a derailment, though the train, somehow, did not go on the ground. 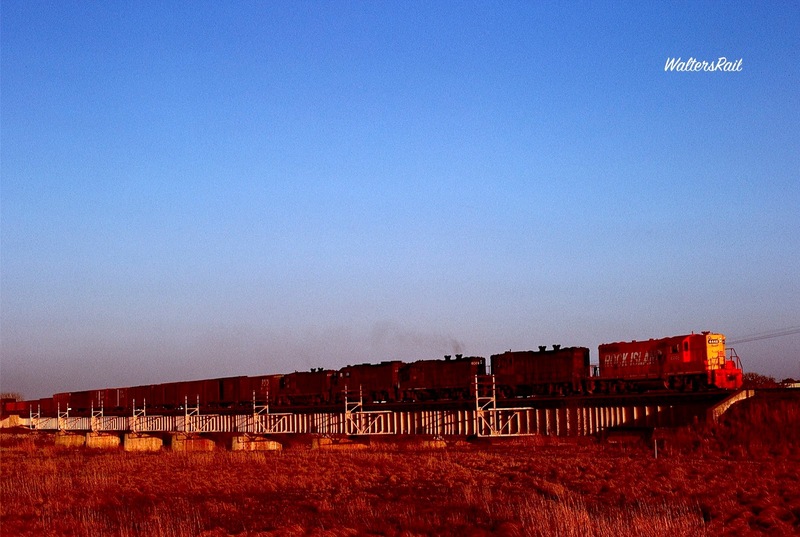 My photographs of the passing siding at Concho Hill are laughable. (See the cover image for this post.) You would bet your life that trains could not possibly stay upright on those rails. Yet they did. In those days I developed a theory. The more paint schemes a railroad went through, the closer it was to collapse. Why? 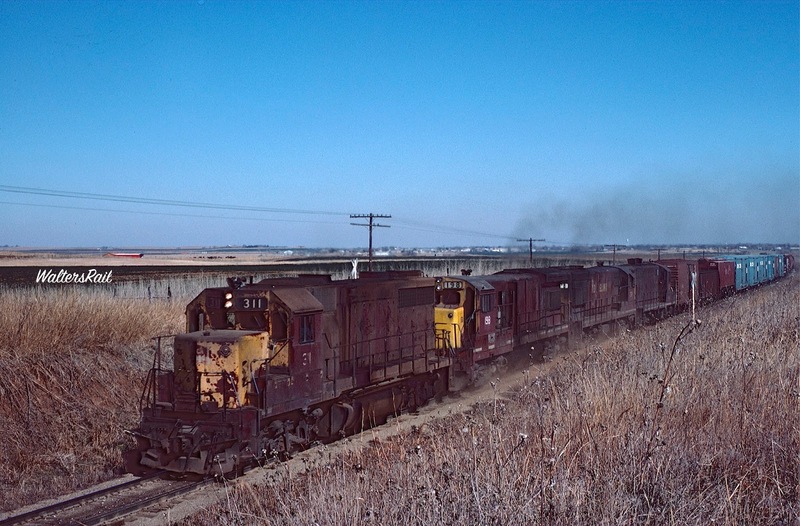 It is difficult to comprehend the dreadful condition of the railroad industry in the 1970’s. Over-regulation and archaic labor rules were strangling even the strongest carriers. 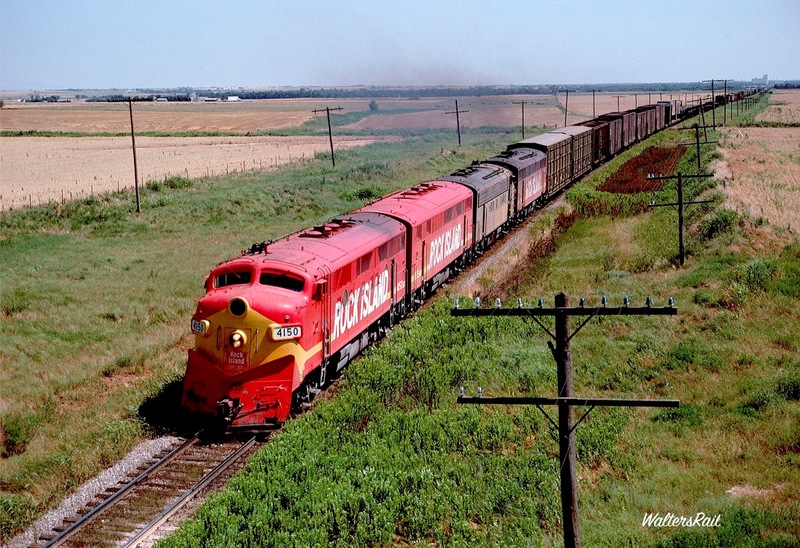 My photographs from that era of the Santa Fe north-south mainline through Oklahoma show roadbed in desperate need of ballast and new ties, and the Santa Fe was perhaps the strongest railroad in America. The Rock Island’s track was far worse. So exactly how many paint schemes did the Rock Island go through? 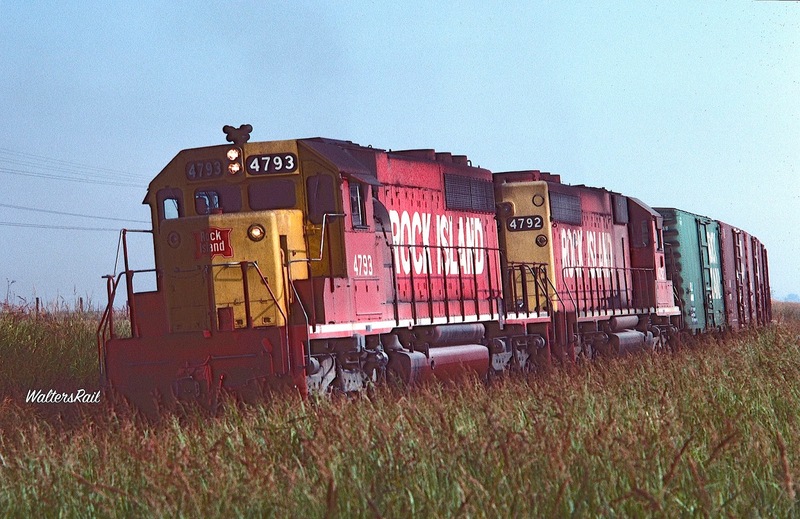 There were at least five different freight color systems during the years I observed the company: early maroon with pinstripes, solid maroon, maroon and yellow, red and yellow, and the last, that artsy blue-and-white pattern called “The Rock.” In addition, the Rock Island also slapped its logo on the noses of inherited Union Pacific and D&RGW engines. 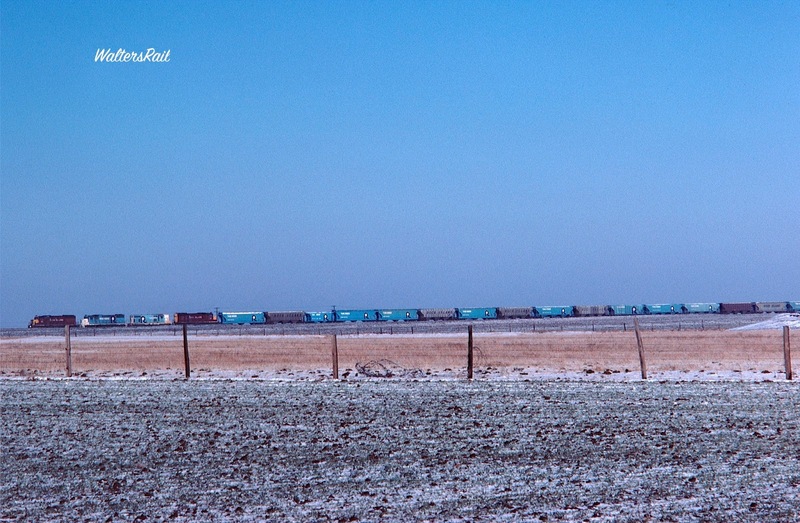 I took a photograph of a southbound freight near Okarche, pulled by nine units, the first five of which were F units. I think I can see every Rock paint scheme except Bankruptcy Blue, as well as two Southern Pacific units. Two F-units might be the same scheme, though the grime makes it difficult to tell. My favorite scheme was the bright red and yellow. 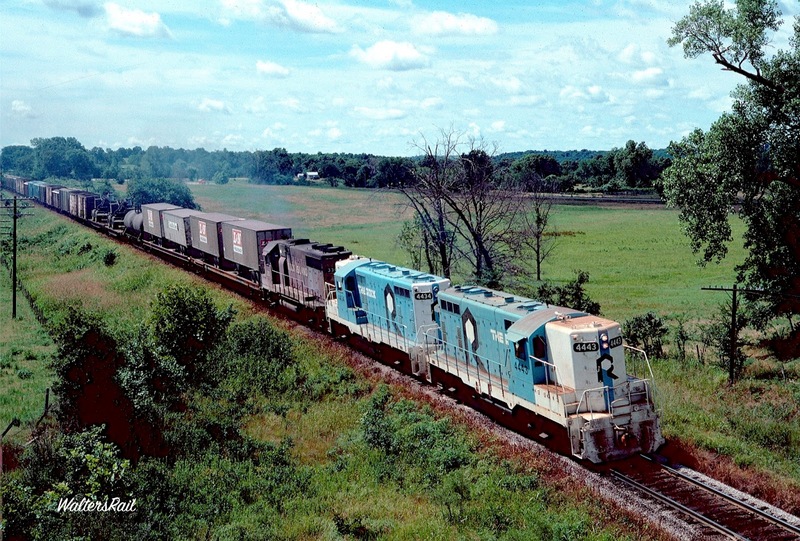 I also enjoyed the blue and white “The Rock” scheme, which appeared in the year of the railroad’s demise. I could never figure out why anyone bothered. But someone did, proving that the bounds of human resilience are indeed wide. Now the Rock Island is a vague memory, gone more than 30 years, like my grandparents. From time to time, I still chase Union Pacific trains on the north-south main, and every once in a while I drive through El Reno. Most traces of the old yard are gone. U.S. Highway 81 crosses on a large overpass, but the only things beneath the highway are fallow, weed-covered ground, a small creek and a few sets of track where the UP occasionally parks box cars. Maintenance buildings, lights poles, engine terminal, yard tower – all were removed when Ronald Reagan was president. People today wonder why the overpass was built in the first place, but I know. That is why, when I awake in the morning, I feel like the Rock Island. Unbelievable page. Your commentary is exactly what I observed and felt. I worked on the Frisco for some time in the mid-1970s, and watched the parallel Rock Island wither away from existence. Their mainline looked like some of our most desolate, nearly abandoned branches, such as the one from Blackwell to Winslow, Kansas and Beaumont, Kansas before that. I loved that line, but the track was scary. Trains are amazingly resilient. They stay on the tracks, no matter what, until something finally just knocks them off. The Rock was as twisted as they come, but the trains held... usually. 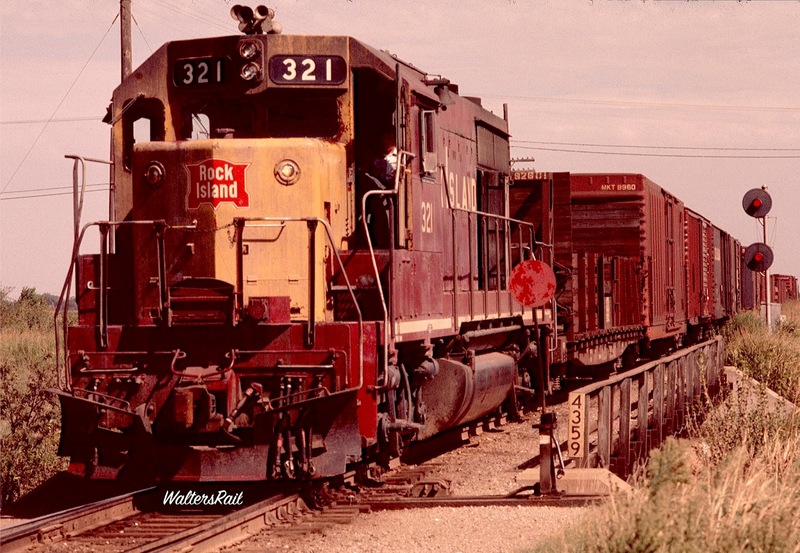 How could an icon like "The Rock Island Railroad" disappear? It was like the sun and the moon. It was always there. It was big and powerful. 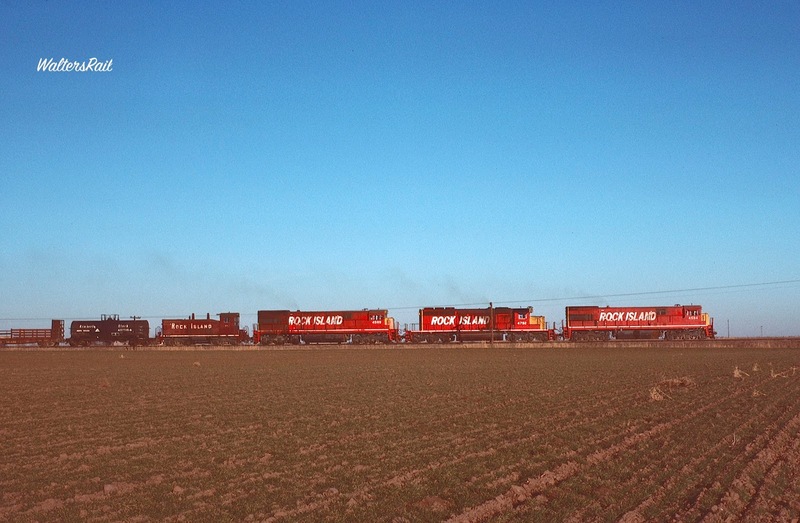 It was ubiquitous, for you saw Rock Island boxcars even on the east and west coasts. But disappear, it did. And when it did, it sent shivers up the spines of every railroader in the country. Conrail barely saved the East Coast. The mergers saved the rest. Santa Fe held out the longest. And believe me, they were scared, too. When I tried to get a job on the Santa Fe in 1976, they were not hiring. They weren't in the mood to talk about it. They didn't know if they'd ever hire again. That was the AT&SF! People do not know what happened to the railroads. The "regulatory agencies" and taxes sucked them dry. Classic "killed the goose that laid the golden eggs" scenario. Despite warnings that began in the late 1940s, the pressures continued, the government extracted more golden eggs, and finally just went for the goose. The stupidity of the regulators and Congress nearly caused the collapse of the American economy over the lack of our main carriers. The Staggers Act was finally a life-saver, but thrown about 30 years too late. It brought back some lines, but most of the small roads were lost, as well as many large ones. 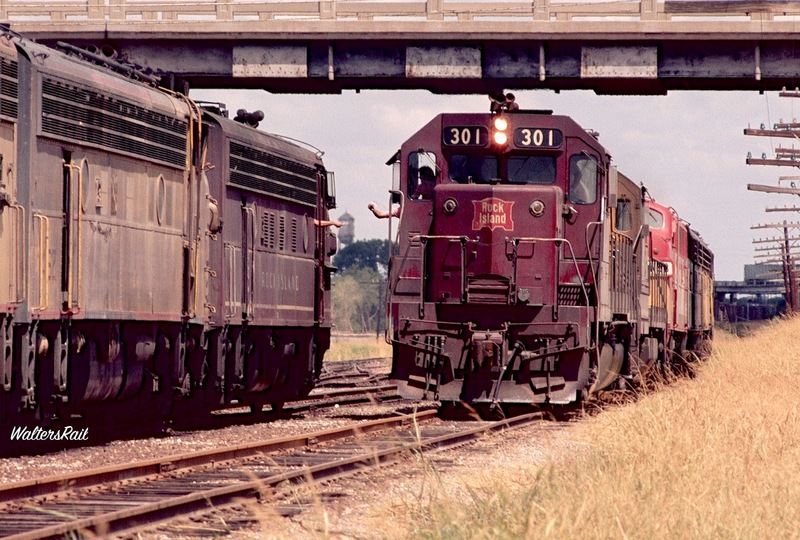 Then the mergers finished off the names of all but 5 major US railroads. People don't understand what we once had. What was lost. When you see little ghost towns all over the country side, it might be worth considering that there once was a railroad there. There once was an economy there. Gone now. What a wonderful tribute for the once mighty Rock Island. 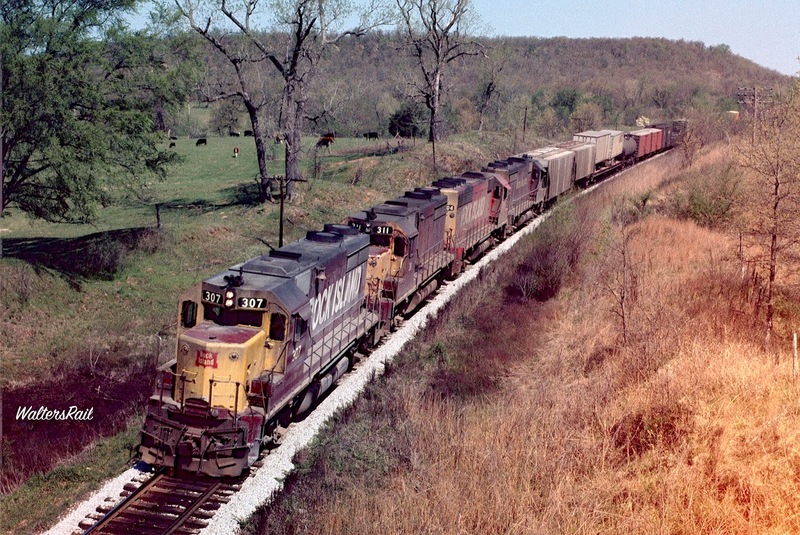 I live in Missouri, where efforts to try and keep the St. Louis to Kansas City line active were undertaken, but the west end of the line was never reactivated, while trains continued as far west as Belle -- just a few miles east of the longest trestle in the state of Missouri spanned the Gasconade -- until 1983 and then slowly retreated eastward...to Owensville, then Union. 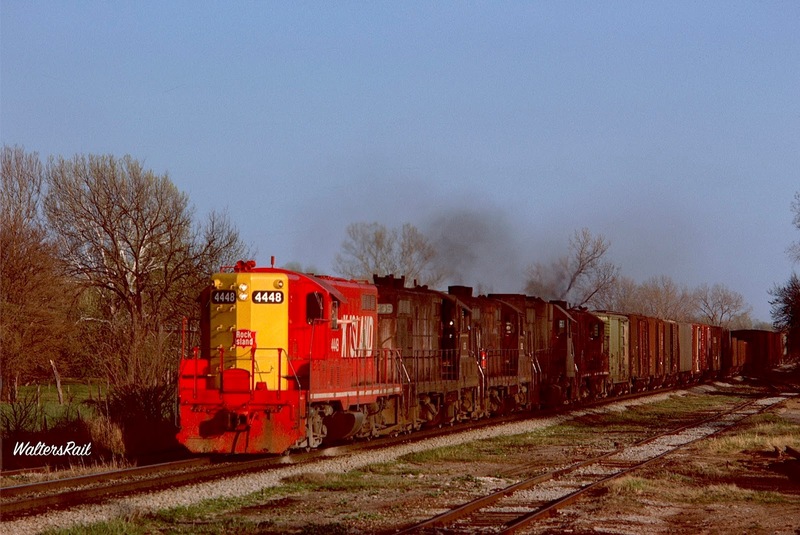 The line from St. Louis to Union is still operated today by Central Midland Railroad, while the remainder of the line, which was never officially abandoned is being converted to a trail...the lines rails and ties removed over the past 18-24 months. In addition to that connection to the Rock, I went to school at the University of Oklahoma (after the line had shut down). In a span of weeks, I fell hard for the wide open space of the state. I was only there for a few years, but when I read "The north-south main traversed those fields in some of the loveliest, red dirt country you will ever see. ", I knew exactly what you meant. The winter wheat, the blaze of a sunset, the forks of lightning across a canopy of thunderheads...it may not be everybody's embodiment of picturesque, but it is and always will be mine. Thanks for your efforts to document the line and sharing it! Paul, this is a fantastic collection of beautiful photos of one of my favorite parts of the Rock Island. My grandparents lived in Okarche. In your photo of 4154 South, their house is hidden in the cluster of trees directly above the locomotive and to the right of the municipal airport hangar; my uncle's house, which was originally my grandparents' house, is visible at the extreme right-hand edge of the photo, across the road from my grandparents' later house among the trees. 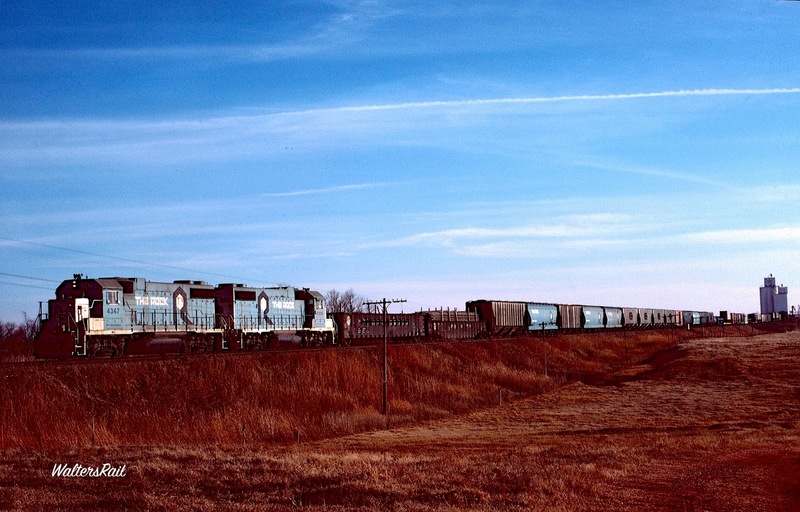 As a kid I would be able to hear southbound trains climbing the hill out of Kingfisher long before they got there, because the house was generally quiet since there were few electronic distractions and noisemakers in the house. I would be able to walk back to the fence line opposite the airfield and watch those trains move through town - sometimes at a crawl, and sometimes really moving. It was a great theater. My family lived there - cousins still do - throughout the 20th Century, including when a 5000-class Northern blew its boiler in town, an event they remembered clearly. In the 30's they would feed transients from the trains in exchange for farm work. 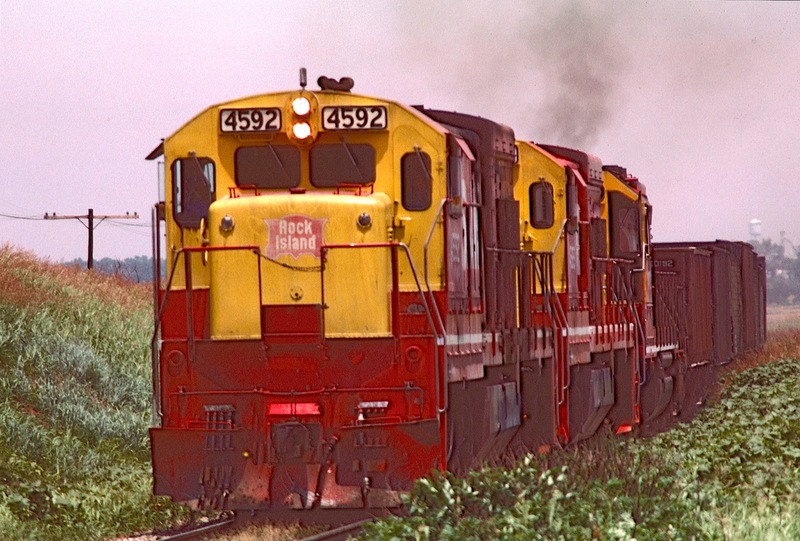 My dad was RI's safety manager in the 1970's, and we would always stop for a roll-by for any train we saw while we were driving US 81 en route to Okarche. These photos are pure gold for me. Thanks for sharing them! All climbers should experience the statement of faith:dig this Take nothing, leave nothing. Love the photos. My memories are from the “Little Rock” that ran from Biddle Yard to Ville Plat, LA. 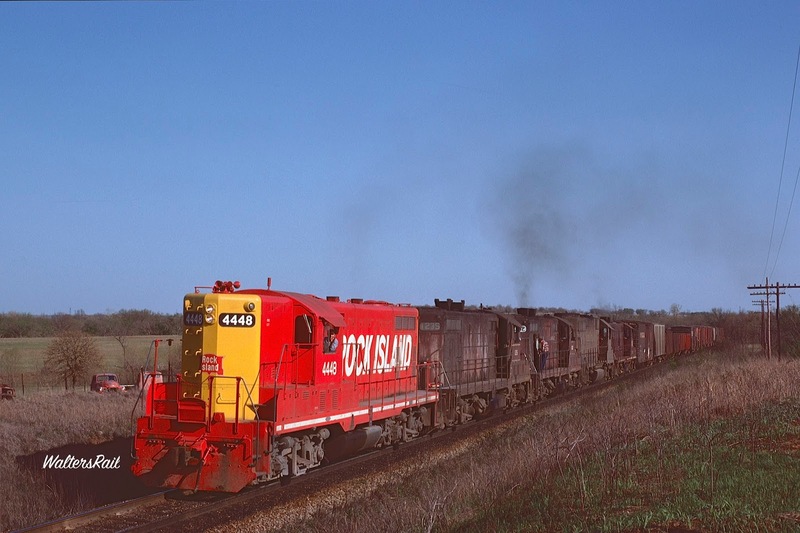 I went to college Ruston, LA and would watch the Saturday local exchange cars there with the east west ICG. Have some pictures from a local going thru Ruston near the end that I am willing to share. The freight house is still there & functions as a bank. Thank you for posting this. This is history that MUST be recorded and remembered. 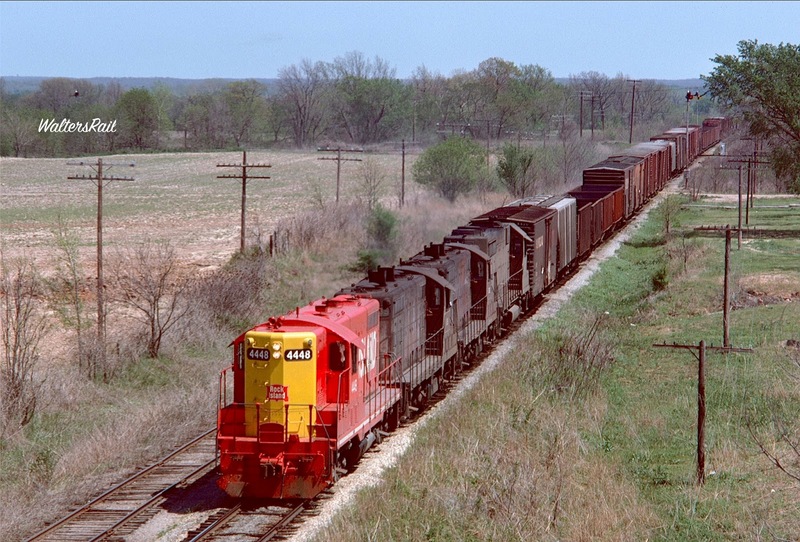 So many little towns in western Oklahoma exist only because these railroads were their life blood. What is left today is just remnants of what is left behind. 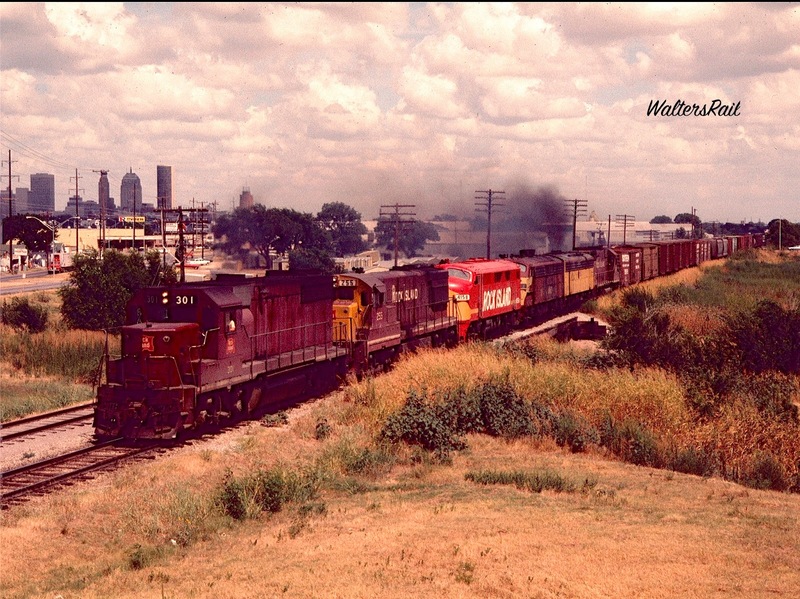 CRI&P 301 West Meets F-Units In Oklahoma City -- July 1978 - Nope, not 1978. No, The Biltmore hotel is still standing in the picture. The Biltmore Hotel was demolished in October of 1977. Just a friendly correction. 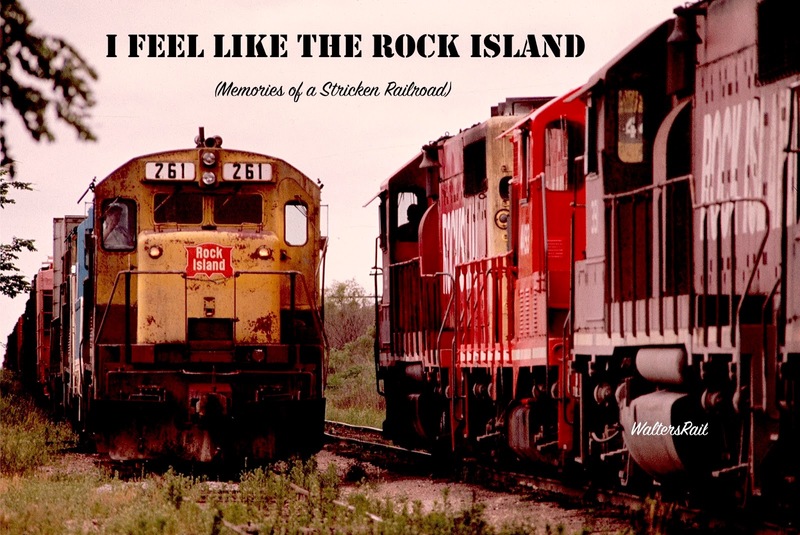 Great pictures of the Rock Island.